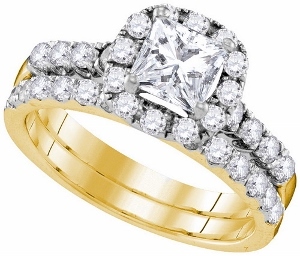 1.87 c.t.w Diamond Bridal Set with 0.75 c.t. Center Princess Cut Diamond. 1.87 c.t.w Diamond Bridal Set with 0.75 c.t. Center Princess Cut Diamond. Gifts of romance exchanged between lovers, the elegant rings featured in this bridal ensemble are set in cool, sparkling 14K yellow gold single princess cut diamond is crowned at the center with additional swirl of round diamonds are sure to cherish your love of togetherness for a lifetime with diamonds totaling 1.87 CTW. Center stone is 0.75 ct.